Its rare in 2013 to find an album that really pays its dues to the high powered rock and roll sound of the 80s. Many bands go for either glam or thrash when trying to evoke the spirit of that decade. 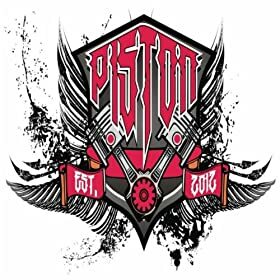 But not Piston, they charge forward with a Guns N Roses inspired rock sound that causes heads to bang and fists to pump. A band who are simply fun to listen too Piston understand what it is to make rock and roll. A band who I have adored since the early days its exciting to hear that their new EP Playing With Fire more than meets their original promise. What really sets this EP apart is its crazy and sparking sound. The riffs sound very much in tune with the bluesy vibes that influenced so much of the scene. The songwriting is also incredibly tight with fun choruses and clear musical development. The vocals help to give the band so much of their power, they give the music a soaring might that can not be matched by other groups their singer, Steve Nunn, is simply that good. The riffs too help to grant this record a fiery rock and roll sound that few other bands can compare too and none can truly overcome. In conclusion, if you're looking for some great new rock to show that the genre can still be fresh in the 21st century then Playin With Fire is the EP for you. With crazed solos and a ton of energy Piston is a blast to listen too. These five tracks are a blazing testament to the greatness of rock and roll. As the record concludes with a stellar cover of Proud Mary things feel like they have come full circle. Piston have proved themselves as potential rock gods and now they're paying tribute to their heroes. Lets hope that their upcoming album manages to blow the lid off this record!